From K.I.T.T. to General Lee to the Batmobile, cars have been stars on the small screen ever since the birth of television. But what happens when the shows get cancelled? Do the cars die on the set, or do they continue living a life of fame and fortune? Luckily, most of them live on far beyond the years of their television shows. This famous 1969 Dodge Charger from “The Dukes of Hazzard” is the king of the car chase, so it is no surprise it is a hot commodity in the car-collecting world. 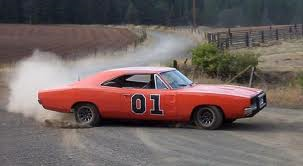 Boston.com reports that General Lee sold for an astounding $9,900,500 through an eBay auction in 2007. It is actually the second-highest selling car out of all of eBay’s auto auctions. Who is the proud owner? William Fisher, a website owner. This famous talking car was David Hasselhoff’s best friend in the 80’s classic “Knight Rider”. Even though the car couldn’t really talk, it is still considered a piece of American culture and was listed for sale for a whopping $149,995 in a Dublin dealership in 2007. Few cars have inspired more imitations than the famous Batmobile from the “Batman” television show that made its debut in the 1960s. Even though there are several fake ones out there, the original 1955 Lincoln Futura, otherwise known as the Batmobile, has a comfortable home in the Cayman Islands at the Cayman Motor Museum. It is even kept company by the Batcycle. While this 1921 Oldsmobile truck doesn’t have its own name, it is still worthy of some attention. The Clampett clan brought this car to fame in “The Beverly Hillbillies” television show. They rode in the jalopy all the way from the Ozark Mountains to California. Instead of residing in Beverly Hills, the antique has made its way home and now resides in the Ralph Foster Museum at the College of the Ozarks in Missouri. It may not be a car, but motorcycles still have their right to fame. Take the famous “CHiPs” motorcycles for example. For Erik Estrada, sharing the screen with these rides paid off. It is reported that he still owns one of the famous Kawasaki KZ-1000P motorcycles from the show.